North, Bill. ...to build up a rich collection...:Selected Works From the Marianna Kistler Beach Museum of Art. ^ a b "Sandzén Chronology". The Birger Sandzén Memorial Gallery. Retrieved 11 October 2013. As a tribute to Sandzén's contribution to Bethany College, the Birger Sandzén Memorial Gallery was dedicated on the college campus in 1957. It houses paintings and archives related to Sandzén and a number of his contemporaries. 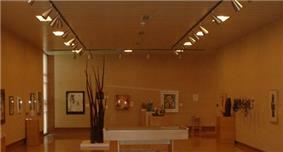 Also, as part of the regional interest two of Sandzen's paintings are held by the Beach Museum of Art at Kansas State University. The paintings Still Water and Fall in the Mountains were two of the first acquisitions by the museum. In 1940, Sandzén was given recognition for promoting cultural relations between the United States and Sweden. He was awarded both the Order of Vasa as well as the Order of the North Star by the Swedish Government. He also received honorary doctorates from various institutions, including the Midland Lutheran College, the University of Nebraska, and the Kansas State University. Although most of his works are in oil, Sandzén was also a talented printmaker and watercolorist. He adopted a thick, textural, impasto style of painting, with the use of strong colourful brushstrokes. His bold use of stroke and color has been described variously as post-Impressionism, expressionism and fauvism. His woodcuts and linocuts were to have a lasting effect on artists to come. His artwork has been compared to Vincent van Gogh and Paul Cézanne. Sandzén was taken with the Smoky Hill River Valley area of central Kansas, which provided much of the subject matter for his paintings. Many of his paintings feature the great landscapes of the American Southwest. Sandzén painted many landscape scenes, including depictions of the Rocky Mountain National Park and Yellowstone National Park, both favorite venues for his work. 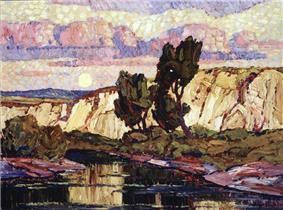 He also spent considerable time painting landscapes within Kansas. According to curator Bill North, he frequently painted landscapes from Graham County, Kansas, where his wife's parents moved in 1906. Later in 1894, Sandzén accepted a teaching post at Lindsborg, Kansas which would be his home for the rest of his life. He remained on the faculty for fifty-two years, teaching various languages as well as art in his first year at Bethany. Sandzén would go on to become the head of art at the college until his retirement in 1946. In 1897, Sandzén met Alfrida Leksell, a Bethany College piano student from McPherson, Kansas. They married in 1900 and had one child, Margarita Elizabeth Sandzén, in 1909. At the end of his studies, Zorn and Bergh recommended that Sandzén complete his painting studies in Paris. In 1894, Sandzén left Stockholm to study under impressionism. Sandzén’s early work displays these influences, along with a tonalist approach. Sandzén was born in Blidsberg, Ulricehamn Municipality, Västra Götaland County, Sweden, the son of a Lutheran minister and his wife, an accomplished watercolorist. A protégé of Anders Zorn, Sandzén showed an interest in art from an early age, and at the age of 10 joined Cathedral School (Katedralskolan) situated in Skara, to study art under the tutelage of Olof Erlandsson, a graduate of the Royal Swedish Academy of Arts. After graduating in 1890, Sandzén studied for a short time at the University of Lund before moving to Stockholm. It was his intention to enroll at the Royal Swedish Academy of Arts. However, the waiting list proved too long for him. Instead, he sought out and joined a group of young artists who were studying under Anders Zorn, Richard Bergh and Per Hasselberg. This group would later be known as the Artists League (Konstnärsförbundet).